The professional services company EY is awarding the Entrepreneur of the Year in Serbia recognition for the seventh year in a row. There are 33 entrepreneurs from 27 companies in ten industries from 12 cities and towns in Serbia in the running. These entrepreneurs employ over 2,000 people. In the previous year alone, their operating income amounted to RSD 23 billion. At yesterday’s press conference, EY announced the award ceremony. The continuous growth of the number of candidates year after year confirms that there is a great potential for the survival and development of entrepreneurship. Nearly 200 entrepreneurs who have competed in the past 7 years employ 18,000 people, and in the previous year alone, they had an operating income of RSD 156 billion. – EY Entrepreneur of the Year gives us a great opportunity to see and follow the most successful endeavors in our country. Also, this privilege obliges us to be better each year. This year’s choice of candidates has certainly exceeded our expectation, considering that there are 33 candidates which had an operating income of RSD 23 billion in the previous year alone and employed over 2,000 people. I am especially proud of the fact that, in this year’s selection, there is also the largest number of innovative companies since the EY Entrepreneur of the Year program has been organized in Serbia. The success of Serbian entrepreneurship is also shown by the fact that, in these seven years, nearly 200 candidates have stood out, being the brightest examples of the local economy – stated Ivan Rakic, the Country Managing Partner for Serbia, Montenegro and Bosnia and Herzegovina. – Supporting SMEs and promoting good practice examples are some of the tasks for all of us who are actively working on improving the competitive advantages of the local economy. For this reason, the EY Entrepreneur of the Year selection is a project in which ProCredit Bank will take part, all to the end of giving our biggest contribution to the promotion of the best and the most successful local companies, on both the national and the international level. 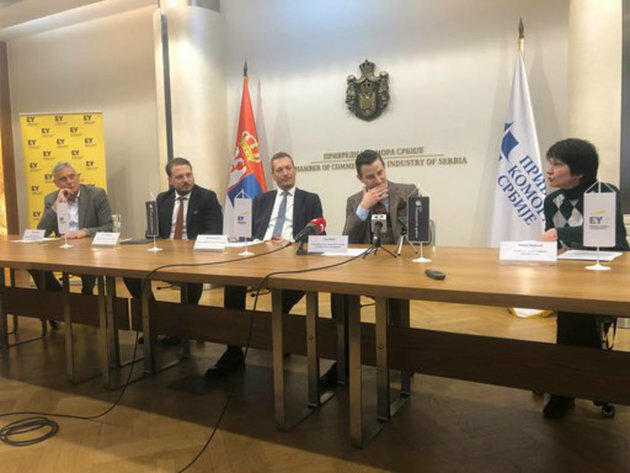 ProCredit Bank will continue supporting small and medium economy in Serbia in 2019 as well. Also, through numerous programs, it will seek to enable the realization of business plans directly contributing to the creation of new jobs and the strengthening of the local economy – said Ivan Smiljkovic, a member of the Executive Board of ProCredit Bank. – Small and medium enterprises and entrepreneurs are the most sensitive sector of the Serbian economy. On the other hand, they are also their most flexible and innovative part. The EY Entrepreneur of the Year program is a great opportunity to highlight those who have contributed the most to the development of the local economy in the past period and to show that the role of an entrepreneur as the carrier of the future economic and technological development is growing more important each year. The Chamber of Commerce of Serbia advocates supporting entrepreneurs through tax credits. Also, the CCIS has opened a center for the digitalization of SMEs as an instrument of support to these companies in implementing the latest technological solutions and switching to digital operations – pointed out Mihailo Vesovic, adviser to the president of the CCIS. The general sponsor of the EY Entrepreneur of the Year program is ProCredit Bank, and the program is supported by the Ministry of Economy of the Republic of Serbia, RTS, Biznis & Finansije magazine and eKapija business portal. The award ceremony will be held on February 21 at Hotel Hyatt Regency Belgrade, and the national winner will compete for the EY World Entrepreneur of the Year award, attending the official ceremony in Monte Carlo in June 2019. More information can be found HERE.